It was the 31st day of July, 2014. I was making my usual trek to town. 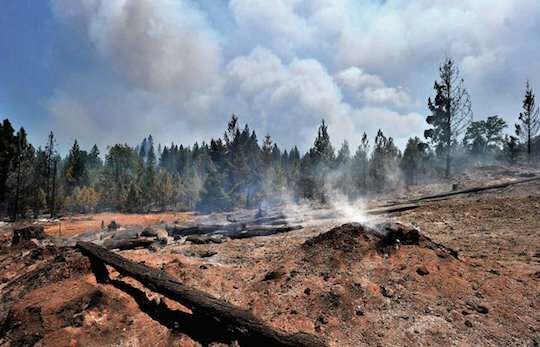 When I came up out of the hollow there was a plume of black smoke and it was really close… a forest fire. I immediately called 911 and they told me it was under control. I watched the fire jump the road and made the decision to turn around and go home. At that moment, a large airplane flew directly overhead and dropped orange fire retardant. “O most Holy Mother of God, save us!” This is the dreaded fear that all homeowners have who live in the solitude of the woods; a blazing fire, on a hot day in summer racing through the forest. At that point the fire was less than 4 miles from my home but it appeared to be moving away. “O Lord, have mercy,” I prayed as I texted my priest Fr. Andreas to ask him to pray for all of us. Within seconds he contacted me back, asking for specifics. 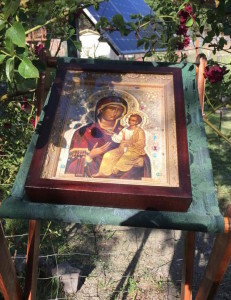 “I’m going to the Icon corner”, I said, “and pray the Akathist to the Mother of God.” “Put her icon by the front gate, after you are through,” he said. So I began to pray intently and with some trepidation. Twenty- five minutes later the prayer was complete and some peace descended. “But which icon,” I thought. And that still inner voice said, “the copy of the myrrh streaming Iveron icon.” This was by far my most precious and favored icon, as I had been blessed to witness the myrrh flowing forth in abundance from it in 1994, when José Mendoz, brought Her to San Francisco. I began to argue in my mind about whether or not to take that icon. After all, it could be damaged or stolen. Wasn’t there another icon that would do? No. It was very clear that I was to take that icon and no other. Someone called to inform me that we were on alert and could soon be evacuated. I began to pack some important possessions; mainly valuables and icons and service/orthodox books. We made a stack by the front door. We got the cat carrier ready and the dog into the car. How could this be happening, I thought. Is this a dream? Wake up wake up, I said to myself. But the smoke and hot wind and dread were everywhere. Quickly I let the ponies out into the next field where there was water and the chickens into the garden. We threw everything into the truck and headed away from the fire to a place of safely. I left the precious icon by the gate with soot and smoke already appearing on the glass. No sooner had we all congregated, than the firefighters informed us that this was not a safe place and that we should drive into the middle of a very large, wet pasture where we would spend the night. It was dusk. The setting sun was dim compared to the glow that the fire produced as it consumed whatever lay in its path. The hot dry wind would quickly pick up and the sound was of a tornado ready to land. The fire was so hot and fast it was creating its own weather. “O Lord Jesus Christ, Son of God, have mercy on me a sinner, “ I cried. “Don’t let my home burn, Lord. Protect us from this fire.” My prayer was urgent and full of emotion. And then I calmed. “This is your land Lord, not mine. You have entrusted it to me for only a short while. May your Holy will be done. If you choose to let it burn, or not, I will accept your holy will. “ I had finally given it over to God. My neighbors and I spent the night in the cool, wet field with mosquitos biting. We watched and prayed as the fire consumed more forest and maybe our homes. Around 3am I fell asleep in my truck and awoke at dawn to thick smoke, helicopters and fire vehicles. Then someone got through and announced that my house was still standing. The fire had not reached it, however it was very close. I quickly drove back through the fire barriers to find the miracle. My home was safe. There was a circle of green around the 6 acre property. 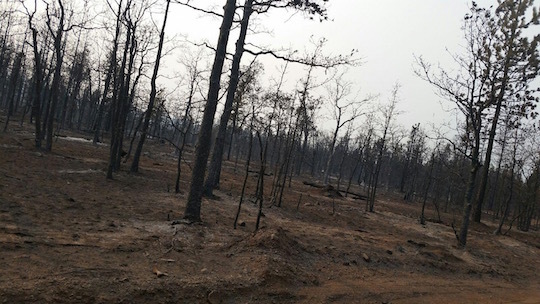 As I walked further up the road I saw trees still burning and a charred black moonscape. Somehow the fire had turned at the last minute and gone in the opposite direction. The damage to the forest around my home was devastating. Miraculously my property was untouched. I went into the house and began to thank the Mother of God for hearing my prayer… for interceding on my behalf. 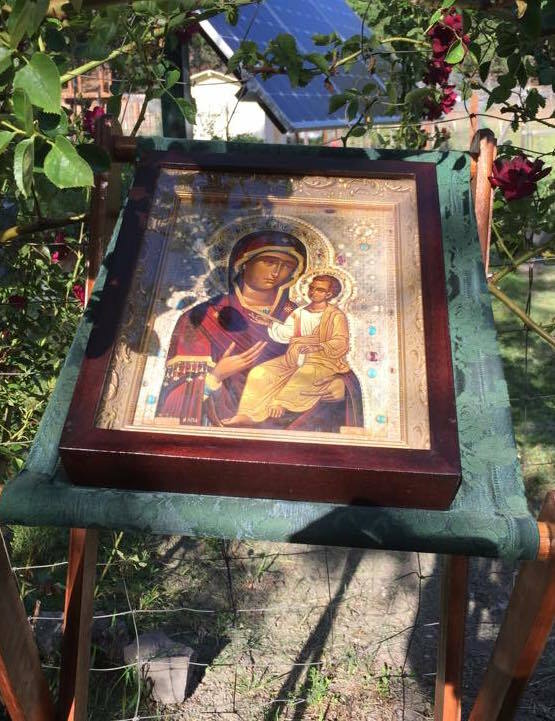 I cleaned the Icon and began to process around the property singing all the hymns I knew to the Theotokos with great joy and wonder. The Lord Jesus and His most pure Mother had heard my solemn prayer and come to my rescue. How great is our God!